Auli also known as Auli Bugyal is nestled among the Himalayas and is graded as one of the best skiing destinations by ski lovers. But unfortunately, it is not much famous among travelers and tourists and fortunately, it was really high on my travel bucket list. I was already captivated by the pictures posted by the fellow traveler of its skiing slopes and wide green meadows extending in Kilometres. So, here was the chance for us to explore Auli in summers and cross one of the more travel bucket list destinations. Stoppage: One can drive in a stretch but still we will advise you to take a halt in between at Haridwar or Rishikesh. The expected temperature at Auli in summers: Varies between 7 to 18 degree Celsius. Auli is at a hill top; just 43 Kilometres short from Badrinath Dham and Mana Village. The steep road deviates and rises 16 Km up from Joshimath. 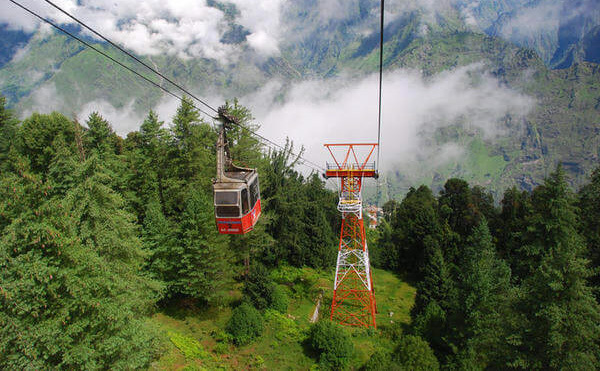 The other way one can reach Auli is by the Asia’s highest and longest Gondola cable car which directly connects Joshimath to Auli covering the total distance (slope distance) of 4 kilometers in 15-20 minutes. Auli is already famous as a winter destination for snow and skiing but not in summers. 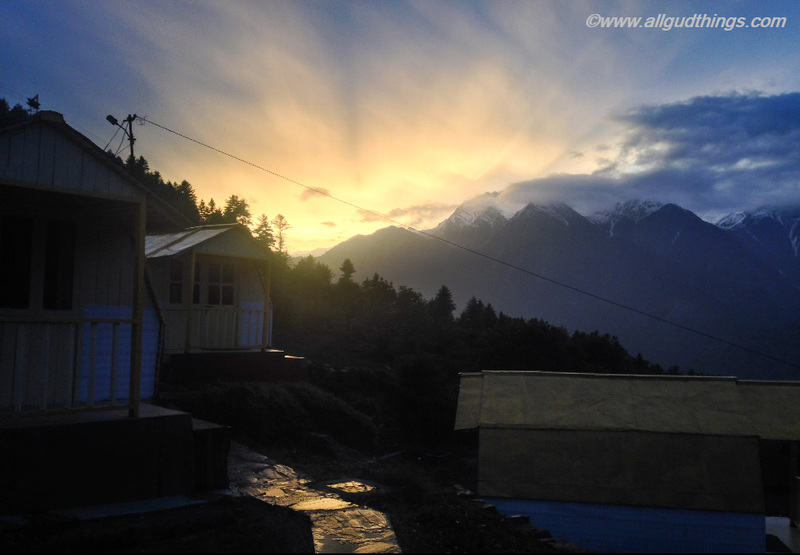 We traveled and explored Auli in May and trust me- it did not disappoint us!! In fact, it surprised and treated us with its different shades and colors. While returning from Badrinath; clouds were following us and they were seen floating in between the Himalayas. And here was the first glimpse of the Auli. We wanted to check in before the rain. 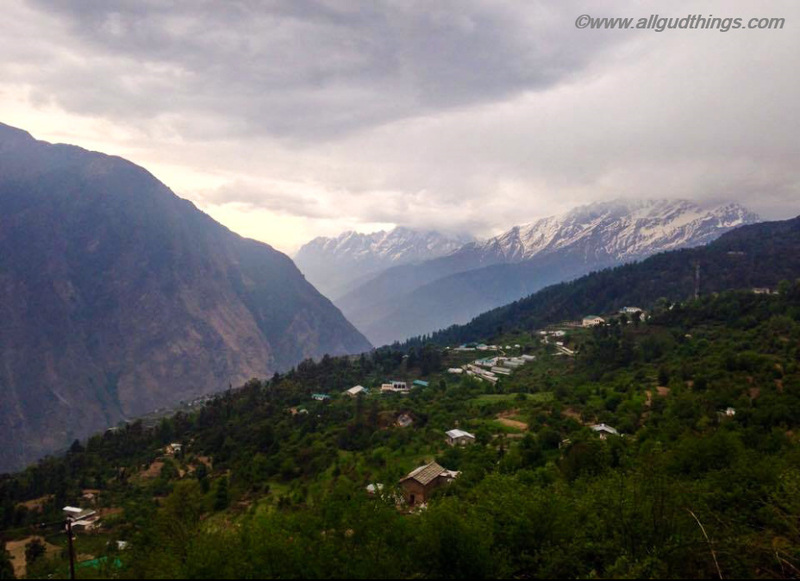 But within minutes, as we reached our hotel Auli Resorts the rain started and the Highland got crystal clear. The subtle colors and shades of the resorts and buildings became bright and started jutting out; leaving us completely spellbound. Our plan was to sit, sip hot coffee and enjoy rain in the lush mountains but nature was ready to shock us pleasantly with some more colors and thrill. Just then, a strong orange light was sparkling in the sky from one side, making it look like a glowing ball. Yes! The sunset along with rain. I should say one of the best views. The sun and its rays did their work tremendously well making the whole valley look more alluring. It was raining & drizzling the whole evening and we spent time enjoying the Himalayan ranges from our resort; hoping the next day to be sunny. The next morning sun was shining at its best. The barren mountain tops covered with snow were ready to wear the golden crowns. At some places in between, these majestic Himalayan ranges were decorated with green patches. Everything in the valley seemed to be muted, except the birds who had full freedom to chirp, and sing. Literally, the feeling was that all forces of nature are united here. The snow clad mountains appeared to be so close yet so far too and they are equally inviting. One doesn’t need to think to get lost in their charm. Just sit and see them, you will be with them. When you are in the thoughts of these stuffed ranges; your dreams can only be pinched out by the noise of flying helicopter in between them. And the only sentence you can utter out is! Wow! I missed this and need to add this to my bucket list for sure. To reach the meadows, one need to go by the chair lift. It opens around 9:00 am and takes one from 2500 meters to 3050 meters elevation in just 4-5 minute. This seemed like a fun just on listening and it actually was. You can check this out here in a video. OMG! The views were spectacular and beyond my words. We could see the huge green meadows extending in kilometers, the highest manmade lake standing in between making Auli meadows and slopes more worthy, with the panoramic views of Himalayan ranges around it. Below and above from the chair lift, one can too see thick oak and coniferous trees. From the meadows, top one can witness the complete Himalayan range. The third highest peak Nanda Devi (7817 meters) stands out with others peaks like Trishul, Chaukhamba, Kamet, Hathi, Godhra, Palki, Neelkanth etc, in line to it. One can hover over these long stretched meadows to see the huge rock formations, grazing cattle’s and flowers. Apart from this; Auli acts as a trekking base for this part of Uttarakhand. One can opt for a day or multiple days treks from here. The shortest of all is till Gurso Bugyal (3 km) Further; 9 km ahead the trail continues till Kwani Bugyal. 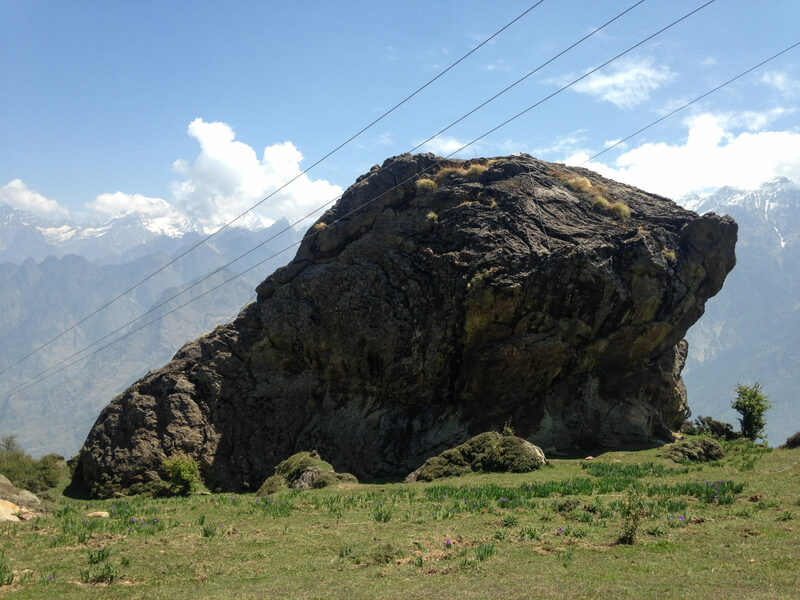 Some other popular ones are Auli – Gorson which is around 7 km, Gorson- Tali (6 Kms); Tali – Kuari Pass (11 km) etc. There are budget as well as luxury options for accommodation at Auli. The Auli resort and Garhwal Mandal Vikas Nigam (GMVN) Hotels are located at the Auli base whereas Hotel Cliff top and Nanda Devi Eco-tourist resort is on the hilltop or in between the meadows. The views from all of these places are breathtaking. The road is really steep and narrow (single vehicle) from Joshimath. So, be slow and patient while driving. Try to cover the journey from Joshimath to Auli, only during the day. Temperature can dip anytime at Auli in summers, so always carry woolens with you. One needs to climb few stairs to reach chair lift. 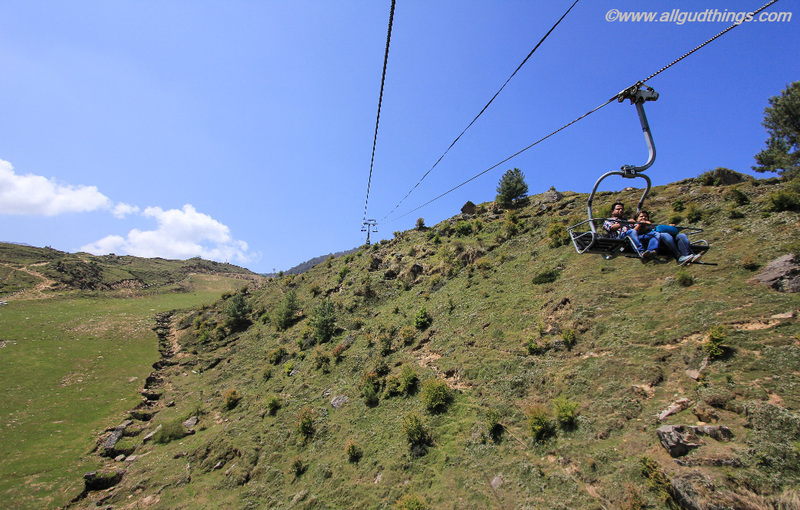 The ticket of a Chairlift for to and fro journey is Rs 300/- per head. The ticket for Gondola cable car from Joshimath to Auli is Rs. 750/- and there is some time limit for returning back too. On the hilltop, there are shacks where you can get tea, coffee, and some snacks. April, May, June are the good months to visit Auli. In July, Auli receives a good amount of showers whereas in August and September there is a flowering season. Try to keep the surroundings neat and clean. Do check out the wonderful artwork of Shri Badrinath Temple, Kedarnath Temple, Himalayan flower, and Monal Bird done by a travel lover. If you find it interesting, please let us know and share it with others. 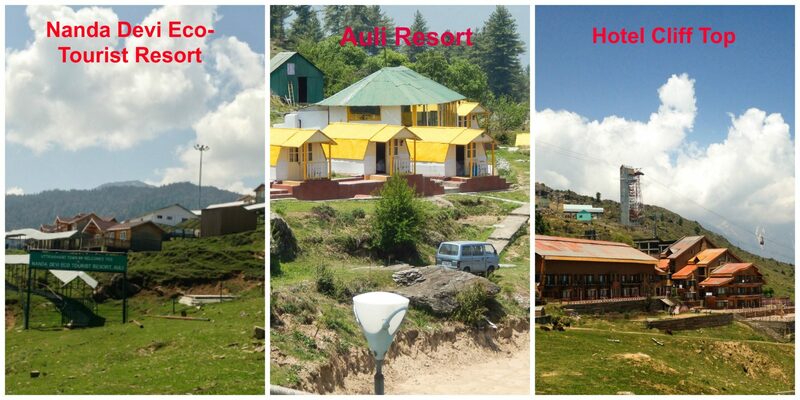 You can read the complete review about Auli resort here. I have always seen snow covered pictures of Auli with people skiing. And couldn’t help wonder how it would be looking in summer. Thanks for capturing the beautiful shades of Auli in summer. Now I know 🙂 This is one destination I want to visit both in summer and winter to see all it’s colors. Wow, it looks like a really magical place to visit. Your pictures are beautiful! Very well illustrated. Lovely read! Wow, there’s so much to see in India. Watching the green and snow capped mountains in a chair lift during summer looks amazing and would definitely be quite an experience. Coincidentally I lived in India when I was child. Yesterday ran to Lake Ontario where I was standing on some rocks looking out at the water. A lovely couple asked me I would take their picture. We struck up a particular conversation about craftsmanship when I mentioned that I had seen jaw dropping fashion in India. They said we’re from India!! That was it the conversation was a fever pitch laughing and talking about getting chai out of a bucket and drinking from a clay cup. I vowed then and there I must return to India within the next 2 years! I like the idea of getting such a different perspective of a place in a different season. You really captured how the colors change. I bet it’s more beautiful in winter. I think it’d be such a rush to ride the chairlift, but I’m pretty sure I am going to be scared since I have fear of heights. But I’d be willing to swallow my fear just to see this amazing view. Just wow. Good thing it’s not that popular with tourists, so it’s not that commercialized. 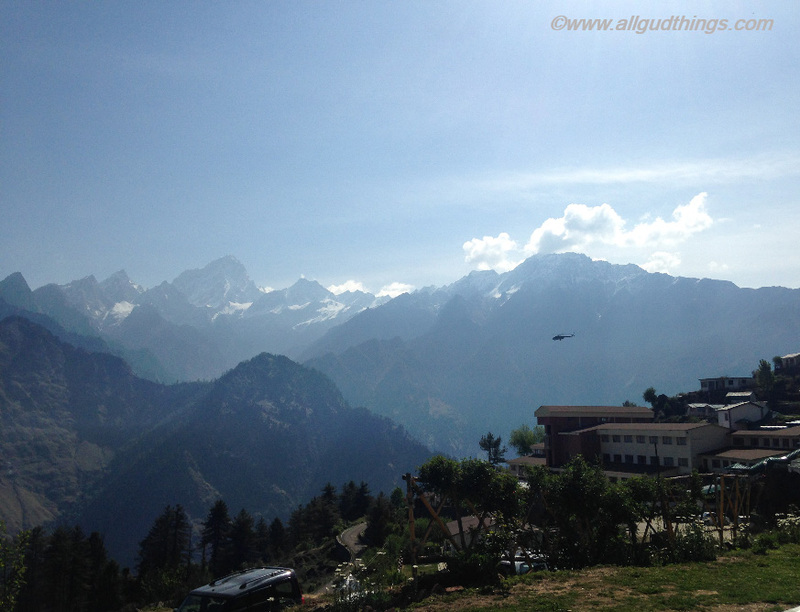 I’ve never heard about Auli before and as I seen it from your pictures, it looks mind-blowingly stunning! I would really love to explore it once I get a chance to visit India. Though I can’t decide yet wether to visit Auli in summer or winter, lol. Great post, makes me want to be on holidays right now! Lovely to visit a ski resort in the summer, far less people and some really beautiful scenery. I’m in awe of that cable car, love those so much. Thanks for this post! Earlier, as mentioned in the blog as well, I took Auli as a winter destination! 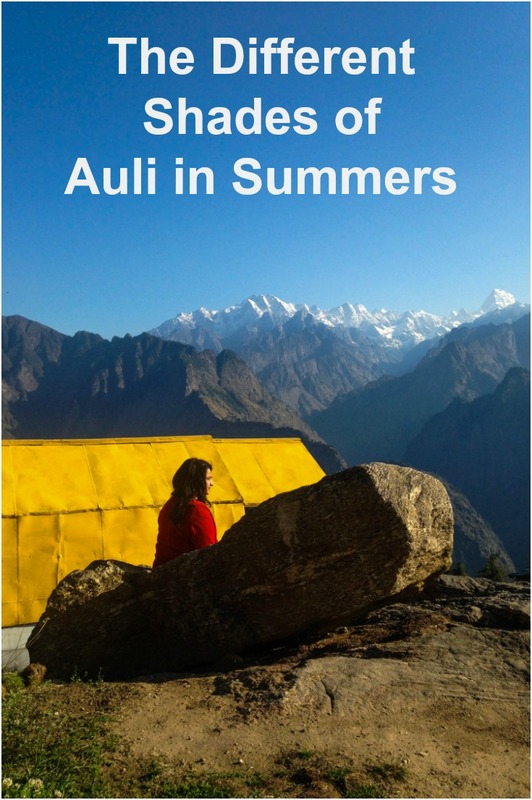 I am looking out for a place to camp with friends this summer and it has to be Auli! Sound like a great trip and the pictures look amazing. Weirdly enough, besides having heard the name Auli, I had no clue about it and that it offered so much natural beauty. Love that they have a cable car and that it is also a ski destination – something I hope people would promote more in the country. I know winter destinations have a totally different charm in the summer and that is so true for Auli as can be seen in your post. I am glad you write about it. Love the description of Auli in off-season, its really interesting and I would consider checking out the place if I was ever in the area. I never even heard of the place but the area looks so beautiful. Fantastic post and loving the photos. wow some stunning views! You can’t go wrong with the himalayas no matter what the season – as long as you know the weather will change regularly! 4km slope in a Cable Car?! That’s an adventure by itself! Chai and cold mornings in hill stations are just the perfect combination! Winter destinations in summer usually gives a very very unusual feel! Reminds me of Swiz in summers!!! Sounds amazing! I’m an avid snowboarder myself and would love a shot to board in the Himalayas. What a beautiful place! I would love to visit, and actually have never even heard of it. I am from Colorado so skiing locations are always on our list of places to see! I love the chart lift, and the views are just to die for! Gorgeous we will have to add this to our bucket list! It always surprises me when people mention India and skiing in the same sentence, I forget the North borders the Himalayas! But it is such a beautiful part of the world – both covered in snow and as a summer hotspot. The perfect destination indeed. A real traveller! 13-14 hours to get there! I love the photo of the teas with the mountain background. I’m not sure I would have found out about this place unless I read your article! You have captured great images on your beautiful experience in Auli. India has a lot to see! What a fabulous destination – such beautiful scenery and those meadows are just spectacular. I’ve honestly never heard of this place, let alone considered going but I may have to rethink that now! What a great place with all those amazing activities that one could truly enjoy. Your photos speaks so much about the lively and full of life about this place. Thank you so much for sharing this with us. One of my friends visited Auli last month and I saw her similar pictures on Facebook about the splendid landscape! Is this place also crowded with tourists similar to other hill stations in India? No not at all. It is quite different and very less no of tourist. Wow! Absolutelly stunning! I had never heard of this place before, but it is definitely on my radar now! Auli seems to be a perfect all year round hill station. I have seen pics of it in Winter but this is the first that I have seen of in summers. I must admit that it looks gorgeous even now. I have been wanting to try this in Winter but now maybe, might consider ot anytime! Auli is a destination, we have been wanting to visit for some time now. In fact we wanted to be there last winter but our plans got changed in the last minute. Hope to get there maybe this year. The place looks so different and green in the summer and the views are really fantastic. I have been commenting in your posts for a couple of times now. I see that you really showcase India in a very different way. After reading your posts and browsing your pictures, it makes me want to visit your country real soon. Auli has so much to offer, the views and landscapes are so much to take in. It is way too amazing. I just want to stay in that place and enjoy all that it offers. Wow, the scenery is absolutely stunning! I didn’t realise there’s a cable car in the Himalayas either!! This looks like my kind of place. I’m definitely putting this on my to-visit list. I am still amazed that it isnt popular during summer. this place looks so beautiful!! The views are beautiful! Breathtaking! Thanks for sharing! Ahhhhh. Those views tho 😍😍😍 this is one of my dream places to visit. So dreamy!! Is it really expenasive here? Ive heard some mixed reviews. Suruchi, the article is written in the way that I feel I myself am experiencing Auli! I so wanted to visit Auli but am not able to due to it being distant. Looking forward to my trip! These pictures of quintessentially Himalayan vistas are so pretty. I have always seen pictures of snow-clad Auli. You mentioned a narrow, steep road part of the way. Did you drive yourself? 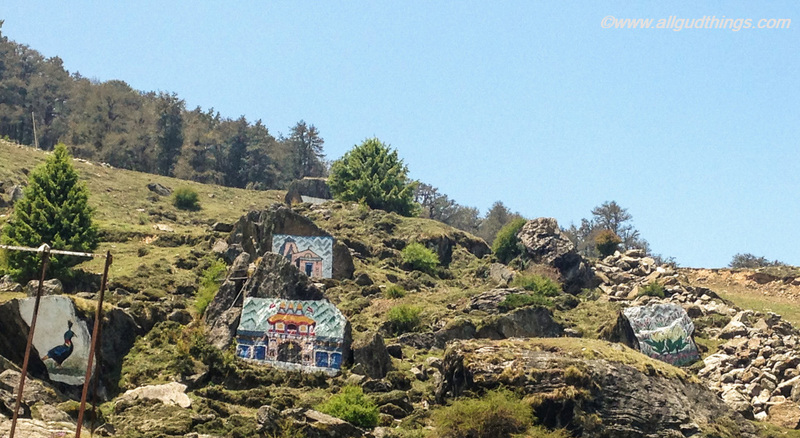 It is so refreshing to see the other side of Auli! Most of us know how beautiful it is being covered with snow but now, we know how equally breathtaking it is during the summer! Thanks to you!